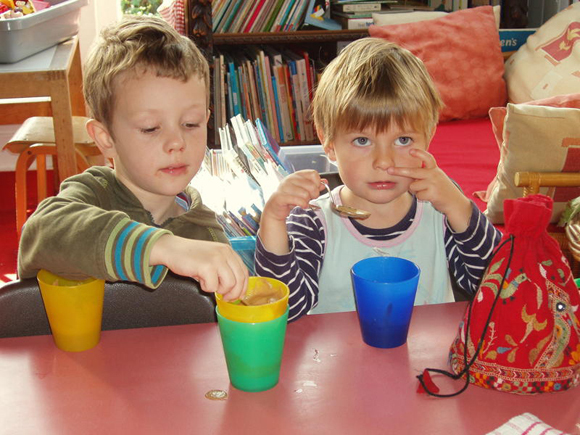 We are a long-established Nursery School tucked away in the heart of Headington, offering a loving start to the joy of learning for 2 ½ to 5 year olds. The Hunsdon House family ethos is rooted in its history, as it started in the 1920s in a family home. 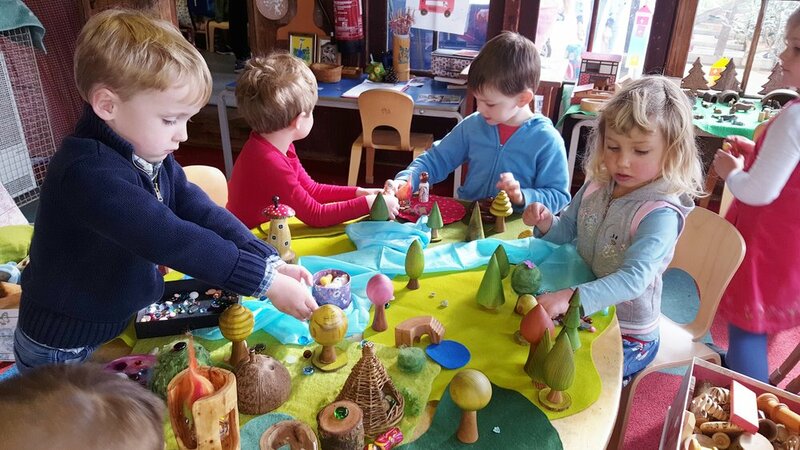 To this day the nursery offers each child a nurturing haven of love and guidance as they navigate the world of friendships, nature and creation. We limit our numbers each day to a maximum of about 25 children and employ 6 caring, qualified and experienced staff with passion for seeing each child develop their full God-given potential. 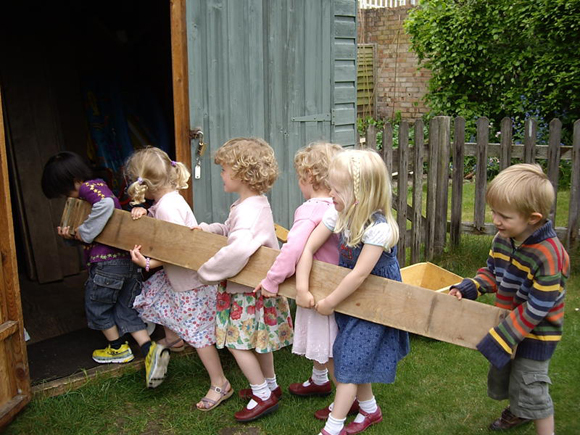 We are a nursery upholding traditional Christian values, and welcome children and families of all faiths or none. We surround our children with light and colour at every opportunity. Many of our toys and educational materials are made of wood. Our children are encouraged in their innate love of and respect for the natural world. Children have a deep need to be connected to the natural environment. 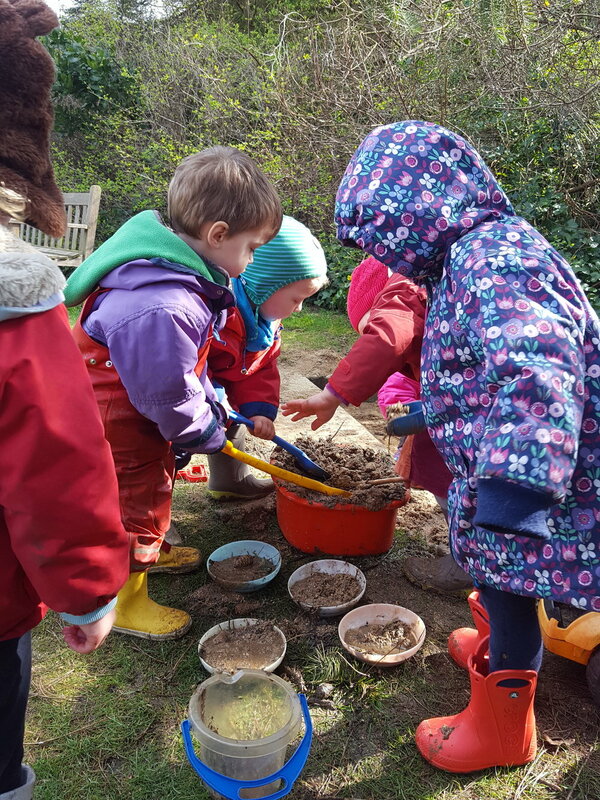 When playing freely outdoors they most often form into little 'family' groups and engage in den making, hiding and 'food' gathering/preparation activities in the forest. They show a deep curiosity and fascination with the beautiful colours of the changing leaves and the many flowers and insects in the garden, their paradise. Finding the seeds inside a poppy head or opening up a bud to see the crumpled petals growing like butterfly wings is an occasion for wonder. On warm summer days, we like to eat our snack or lunch peacefully under the trees. The children love to spot the birds building their nests and we try to guess what they might be saying to one another up in the trees. The children are eager to help care for their beautiful garden! ..... observation and imitation leading to role play. 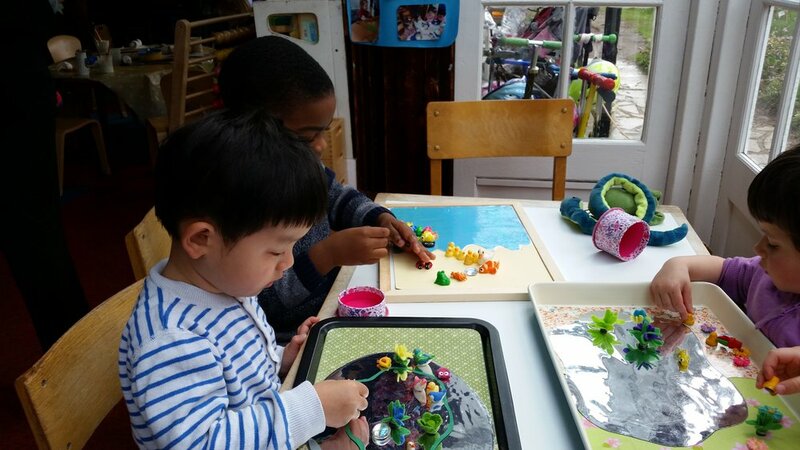 They love to recreate or join in life experiences that let them feel they are engaging in something real, and will instinctively choose to further their own learning in a hands-on practical way. We bake bread every Friday. ..... primarily through their senses before they begin to use rational thought. The quality of these experiences is crucial to brain development and refinement. This boy is teaching himself about size and shape through use of this self correcting Montessori set of graduated cylinder blocks. Whether feeling the smooth, grainy, silky and rough textures of seashells, nuts, grains or sand, tasting and smelling home made apple juice or bread, mixing and stirring mud pies or being soothed by the flow and splash of water, children need to be connected to and touch the physical world with all its sensations, so as to find their place in it. What the hand does, the mind remembers. It is by touch that new brain connections are formed and developed. Our toys are mainly made from wood and other tactile natural materials which encourage calm, peaceful focused play. ......around the age of 2; and they are soon deeply immersed in their own creative role-play worlds, through which they integrate their understanding of the events of their everyday lives. They often choose to create their own props or use very simple objects brought alive by imagination. Imagination is a vital part of a child's cognitive development. A healthy and vibrant imagination leads to greater resourcefulness, resilience, mental agility, robust mental health and creative problem-solving skills in later life. Using open ended natural 'loose parts' this boy is creating a cosy home and a meal for woodland animals. These two close friends have set up home together and are preparing a meal. These children are recreating a lively church service, with one singing 'Hallelujah!' and the other playing the organ. This little girl is creating a story about a beautiful butterfly. She demonstrates how gently the butterfly is touching a flower. These girls have made a train out of hoops and are offering passengers a ride into the forest. 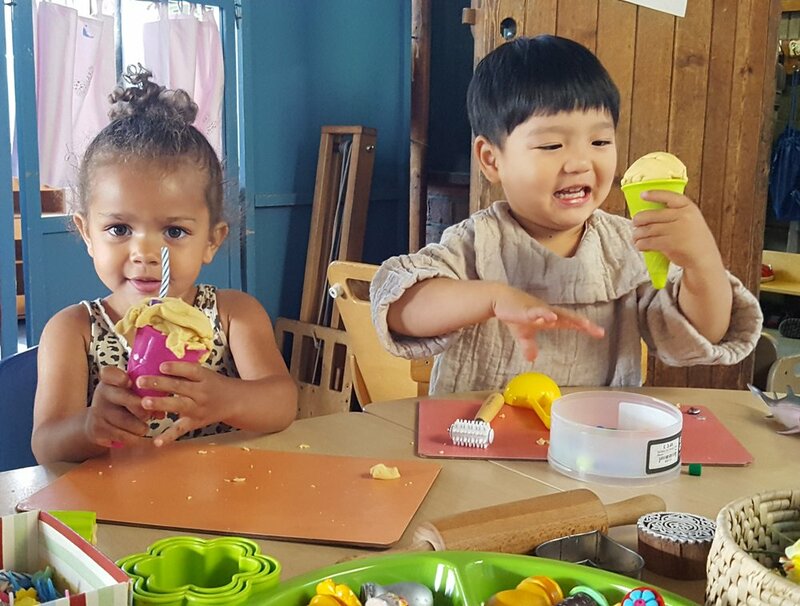 In order to enrich your child's imagination development, our Creative Play Specialist provides exciting weekly heuristic play sessions using a wide variety of natural and beautiful materials. Discovering the irresistible properties of magnets by making a ‘magic garden’! 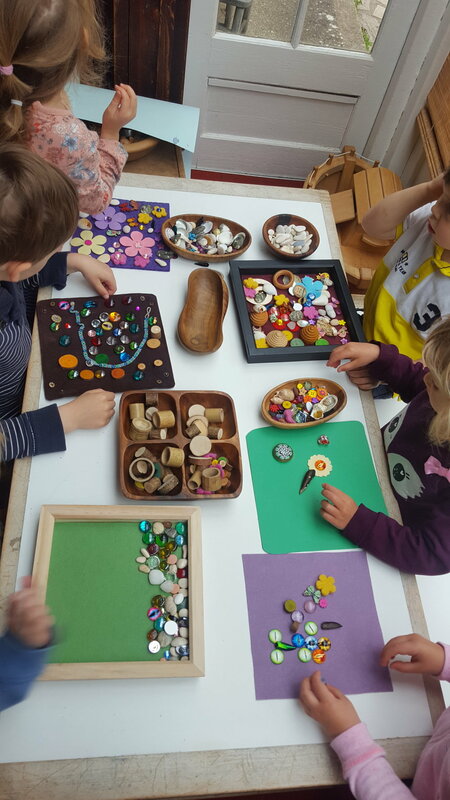 Children create transient art with beautiful loose parts in little frames. The arrival of ice cream cones and vanilla playdough caused great joy! Some of the amazing rainbow playdough cookies we made! ....and show care and respect for others. In this nurturing atmosphere, close friendships develop and flourish, regardless of differences in ethnicity, culture or language, which to a small child are irrelevant. A hand to hold, a companion to explore with, a friendly smile, are all that's needed. ...eventually a close bond develops, where children care about and comfort each other and show spontaneous affection. "I shelter my friend from the rain"
Through sharing fun and laughter together, this little German girl (who had become fluent in English here) helped teach her younger Polish friend the words.